This is held each year on the evening of the 23rd of June and goes on through to the early hours of the 24th (Dia de San Juan). It’s the old pagan midsummer celebration which has been ‘Christianified’ by tacking it on to a convenient Saint’s day (if you can’t beat ’em, join ’em sort of thing). 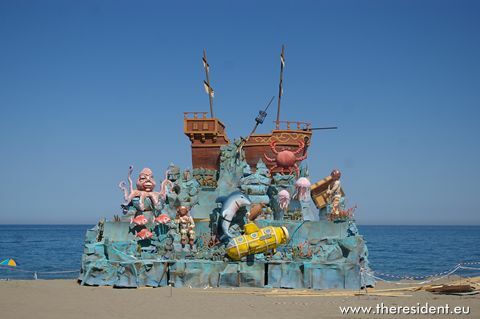 A huge tableau/bonfire (hoguera) is constructed on the beach in Sabinillas a few days before the event. This is a work of art and every year is on a different theme, and it is almost a crime when, around midnight, the whole thing is set alight, when it is also customary to walk into the sea to wash away any bad luck. The night is also marked by a firework display, on the beach in Sabinillas, live music and dancing until the early hours of the morning. This year’s programme has been slightly modified to cater for the Spain v France European Cup quarter final. 7.45 pm Parade by the Manilva Town Band. 8.00 pm Ceremonial raising of the Blue Flag awarded to Sabinillas Beach. 11.00 pm Live music from the group “Dinamic”. 11.45 pm Official welcome from Manilva Town Council. 12 midnight The bonfire will be lit, followed by the spectacular firework display. The music will continue into the early hours of the morning.